A high-ranking Communist Party official has written a book exposing the crimes of the Chinese against Tibetans. His fellow party members still don't suspect that he has defected to the opposition. A Tibetan who once believed in the Chinese Communist Party and carved out a career within the Beijing bureaucracy has now decided to publish a damning report of China's policies in his country. He hopes that what he has written about the oppression of his people will be published as a book in the West, thereby exerting pressure on leaders in Beijing. Dorjee is one of more than 100 Tibetans who have turned to self-immolation since March 2011 in protest of Chinese rule in Tibet. Another man, who also took his life a few days later, left behind a letter that sums up the sentiments of these unfortunate people: "There is no freedom in Tibet. His Holiness the Dalai Lama is not allowed to return home. The Panchen Lama is in prison." The mood is desperate in the region known as the "Roof of the World." Never before have so many Tibetans sacrificed their lives in this manner to draw the world's attention to their fate. But not everyone believes this is the right approach. A few hundred kilometers from the Labrang Monastery, a high-ranking Communist Party official is shaking his head in disapproval. The self-immolations, he says, are an "overreaction, an excessively radical act. Buddhism forbids suicide." And yet he can understand the motives, he says. Conditions are dramatic in his native Tibet. "The economic situation, the standard of living, culture and education have greatly improved in Tibet, he says. But the government exacts too high a price from Tibetans in return for this development, he adds, noting that Beijing is trying to discipline them with violence. "There is substantial surveillance and limited freedom." The man is a senior official in the Communist Party. He is well known, not only in Tibet but also throughout China, and no one suspects him of being a member of the opposition. He is one of the privileged, someone who long believed in the promised goal of a socialist China, one in which not only the Han Chinese, but also Tibetans and all other ethnic groups would lead a better life. But now he intends to make a stand. "I am a Tibetan, and I work in the government. I have the authority to describe what is really going on," he says. He has served the Chinese government since youth. Like many Tibetans, he had who come to terms with the fact that Beijing has ruled their country since the Chinese army invaded in 1950. These individuals include party officials, police officers, propagandists, journalists and engineers, all of whom behave like people who want to live in peace under foreign rule. They assimilate, parrot the party slogans and enjoy their growing affluence, though they often feel miserable in the end. This helps to explain why this contemporary witness sat down and penned an account of the more recent history of Tibet, as seen through his eyes. He focuses on what the propagandists and chroniclers working for the system suppress or sugarcoat, writing: "Everything was and still is far worse than people in the West suspect." He is determined to remain anonymous for as long as possible. "I don't want to mention my name, I don't want you to mention my profession, and you can only describe the place where I live in general terms," he says. He aims to have the book published abroad, which is his only option, of course. If it emerged that he, a respected official, were in fact a Tibetan dissident who compares the "fate of the Tibetans" with that of the Jews under the Nazis, his comfortable existence would quickly come to an end. He could face a prison term and possibly even the death penalty. In the Great Proletarian Cultural Revolution (1966 to 1976), the Red Guards, including many Tibetans, attacked their supposedly "revisionist" and "imperialist" countrymen. Thousands of monks were beaten to death or put in camps, and ancient relics were destroyed. The Red Guards used their artillery to flatten hundreds of monasteries. The Communist Party officials wanted to destroy the culture of their subjects. Tibetan women, for example, were made to wear the kinds of trousers worn by Han Chinese women, and helpers cut off their braids. Clan elders and abbots were sent to reeducation camps, where they were forced to study Mao's directives every day. The Chinese military brutally crushed any rebellions. When monks killed a corporal in the People's Liberation Army in 1956, a Chinese cavalry regiment exacted its revenge in the town of Qiuji Nawa in Gansu Province with an attack on about "200 innocent women and children. They surrounded a tent, threw hand grenades inside and then fired at it." In the early 1980s, the Communist Party had to admit that it had "seriously harmed the interests of the people" with its brutal policy. By then, Tibet had become a permanently restive region. As the Communist Party official writes, Beijing's claim that "millions of Tibetan farmers" had become "masters of their own house under the party's leadership" proved to be nothing but propaganda. In his opinion, there are many reasons for the unrest and the rage of Tibetans. One is that the long-cherished hope that the Dalai Lama could one day return home from India, where the Tibetan government in exile has its headquarters, is beginning to fade. Beijing condemns him as a "traitor" and refuses to even consider talks. It was an affront to Beijing when, in 1987, the Dalai Lama spoke to members of the United States Congress in Washington, where he presented his Five Point Peace Plan. He demanded, among other things, that Beijing put an end to the immigration of Han Chinese to Tibet and its use of the Tibetan Plateau as a nuclear waste dump. According to the Communist Party official, after the visit "a new spirit of opposition began to grow among young intellectuals and a few officials, as well as laborers, farmers and shepherds." Then, in 1988, the Chinese made another mistake. At the end of the annual Great Prayer Festival, senior officials had gathered on a roof terrace of the Jokhang Temple in the Tibetan capital Lhasa to watch the grand procession. As it happened, they were standing directly above a room that the monks considered sacred. It was where the Dalai Lama had always slept during the festival. Soon the group was pelted with stones. Soldiers beat their way through the crowd, and a few party officials, including the deputy party chief for Tibet, had to be lowered from a window on ropes. Monks and nuns repeatedly took to the streets in the ensuing weeks, until Beijing finally cracked down. The central government removed senior Tibetan Communist Party officials and replaced them with Han Chinese, including Hu Jintao, who would later become General Secretary of the Communist Party and president of China. A year later, Hu ordered soldiers to open fire on protesters. According to the author, the incident resulted in the deaths of 138 people and 3,870 arrests, while many others were abducted. Part of the Tibetans' dissatisfaction stemmed from the fact that Chinese immigrants from other parts of the People's Republic were cultivating more and more land. In the author's opinion, this causes serious environmental damage, because the gradual disappearance of grasslands leads to desertification. "The Tibetans have less and less space in which to live, and the environment is getting colder and more severe," he says. A conspicuous example of China's reckless environmental policy is Qinghai Lake, the official adds. Because too much pasture was cultivated and an extensive irrigation system was built, only eight of the 108 rivers that once emptied into the lake still exist today, he says. Things were quiet for a few years after the unrest, which lasted until 1989. Communist Party leader Hu later attempted to placate the Tibetans with billions of dollars in investments. The mineral resources that had been discovered in the region, as well as its strategic importance as a buffer zone between China and its economically powerful rival India, were extremely important to Beijing. But the tension is palpable in the streets of Lhasa today, partly because of the presence of Chinese security forces, who act like occupiers. "The way the members of the Armed Police behave is anything but humane. They kill people as cold-bloodedly as poisonous snakes. They indiscriminately beat local residents, loot their property and kill them if they defend themselves," the Communist Party insider writes in his manuscript. In March 2008, as Beijing was preparing for the Summer Olympics, Lhasa's residents revolted once again. But this time schoolchildren, students and office workers joined the protesting monks, as did Tibetans from other regions. The police and military arrested about 6,000 people. The authorities now see only one way to pacify the Tibetans: more investment, together with even harsher repressive measures. During the so-called patriotic education campaign, which takes place in all monasteries, the monks are required to distance themselves from the Dalai Lama. Many were temporarily or permanently banned from monasteries, and some lamas were imprisoned or sent to reeducation camps. Alleged supporters of people who committed suicide by self-immolation were sent to prison, including six people tied to Dorjee Rinchen, the farmer from Xiahe. Beijing's rulers do not permit a public debate over their Tibet strategy. Very few Chinese dare to even raise the issue, and then only in Hong Kong or through foreign media organizations. Author Wang Lixiong, married to Tibetan lyricist Tsering Woeser, is one of the brave few. He believes that nothing will change as long as hostility toward the Dalai Lama translates into the livelihoods of tens of thousands of officials within the party's propaganda machine. The Tibetan book author puts it this way: "We all have a knot in our heart." The authorities, he says, "view the monks as outsiders. They are not allowed to express their opinions, and they are certainly not permitted to participate in political decisions." 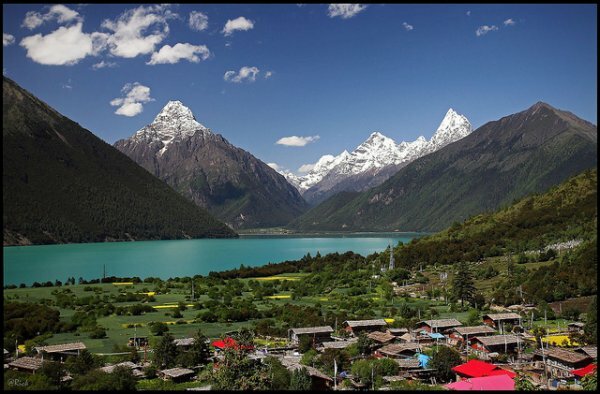 Is there a solution to Tibet's plight? The author remains faithful to his upbringing in saying that it would be wrong to permit the return of a theocratic government, a Tibet in which the abbots are in charge and "politics and religion are one" -- the kind of system many monks would prefer. And the alternative? "We have to practice democracy," he says. "Not necessarily a Western-style democracy, but a unique, Tibetan form. Otherwise we will remain at an impasse."